This isn't the face you were meant to see. It belongs to one of 57 dogs found at a home in Rushville, Ohio, a city just southeast of Columbus. You were supposed to see the spritely faces of puppies. The kinds of puppies who cost hundreds, even thousands, of dollars - and soak up all the oohs and aahs in the world. Well, this is mom. Or at least one of the mothers found at the home-based breeding operation this week - a backyard breeding operation that isn't technically illegal in Ohio if you have a permit. And, it seems, all this face ever soaked up was neglect. This week, authorities descended on the house after receiving a tip about a backyard breeding operation. The condition of the animals onsite, however, is what prompted a tip to local police. In addition to the dogs, rescuers found four horses and a donkey on the property. All the animals are still being attended to by the Fairfield County Area Humane Society (FCAHS), which will be looking for homes for these animals in the days ahead. 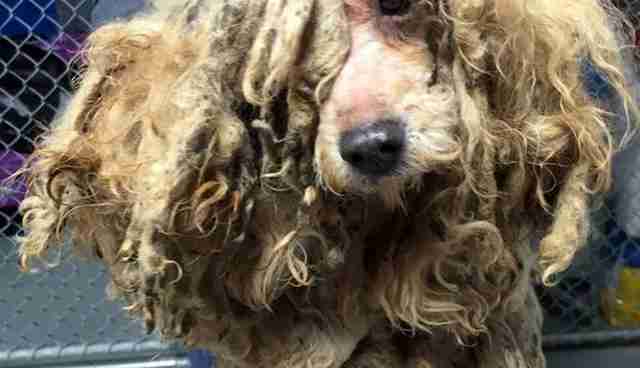 While we've seen many terrible puppy mills - a recent bust in Michigan springs sadly to mind - this operation, located so discretely in small-town America, may be a testament to how easily cruelty can be camouflaged. A puppy mill is defined by the Humane Society of the United States (HSUS) as a "dog breeding operation, which offers dogs for monetary compensation or remuneration." The key to this definition is the operation's failure to meet the "physical, psychological and/or behavioral needs of the dogs." In short, puppy mills cut corners at a terrible cost, as you might expect from a business based on peddling living beings. The typical breeding operation is a nightmarish world, a place where a dog, whose only function is to breed, is often in complete mental and physical isolation. The woman who allegedly ran the Ohio operation may have had a kennel license dating back to at least 2012, the Lancaster Eagle Gazette reports. But her sad collection of dogs, including Chihuahuas, Shih Tzus and dachshunds, will likely earn her animal cruelty charges. All in the name of commerce. "If you want to spend $600 on a particular breed, she had all of them," Corey Schoonover, executive director of the FCAHS, told the newspaper. And, apparently, people were buying. The woman, who has not been identified because she has yet to be charged, was forced to return deposits on several puppies already promised to prospective owners, Schoonover added. Big or small, puppy mills are bad business. Join the fight to have them banned completely.